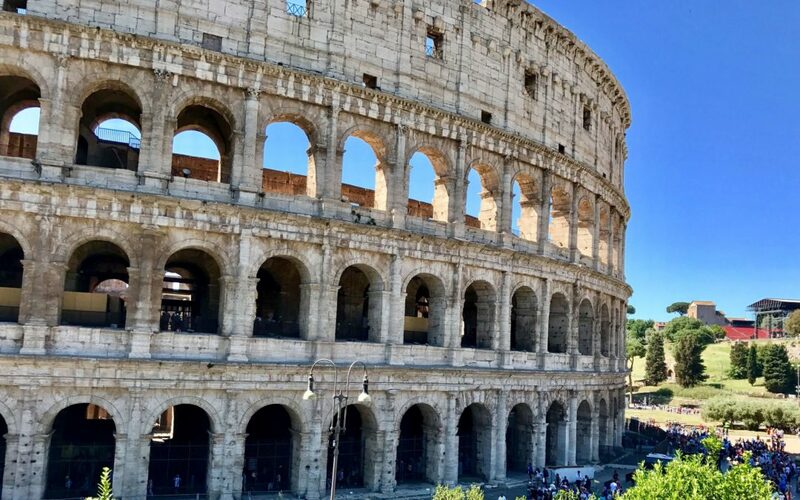 Almost every first time visitor to Rome has the Colosseum on their bucket list. We did too. 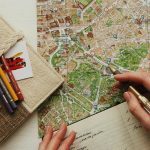 As soon as I started to look at all the options for our visit, I became confused and overwhelmed! There are so many companies offering tours with this or that added extra, promises of skip-the-line passes and entry into the Roman Forum and Palatine too. All I really wanted was basic entry to the Colosseum without all the extras, then I could choose to add on extras if I wanted to. Here’s what I found through my research and visit. It took a few different internet searches before I could even find the official website to buy tickets directly from the Colosseum. You can find it at coopculture.it A basic adult entry ticket to the Colosseum can be bought on this site for €12 + €2 booking fee. It is emailed to you, and you can print and take with you. There is also an option to pick them up from a dedicated desk on arrival. 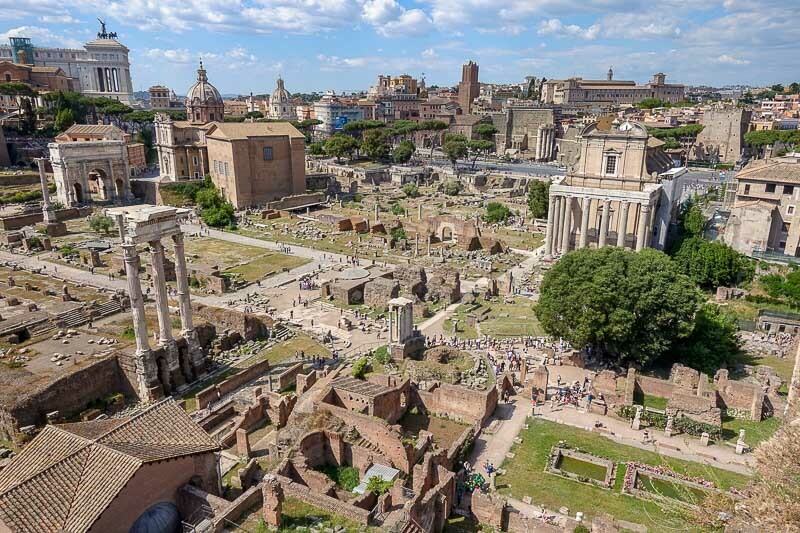 The ticket also includes access to the Roman Forum, Palatine and any current displays. It is valid for two consecutive days any time for the rest of the year. This means you can buy it well in advance and if your plans change a little, that’s okay. There are so many horror stories of the lines outside of any major tourist attraction (see my own Versailles horror story here) that I wanted to avoid the line if I could. Almost every tour I saw included skip-the-line access and used that as a selling point. These tickets also include skip-the-line access. 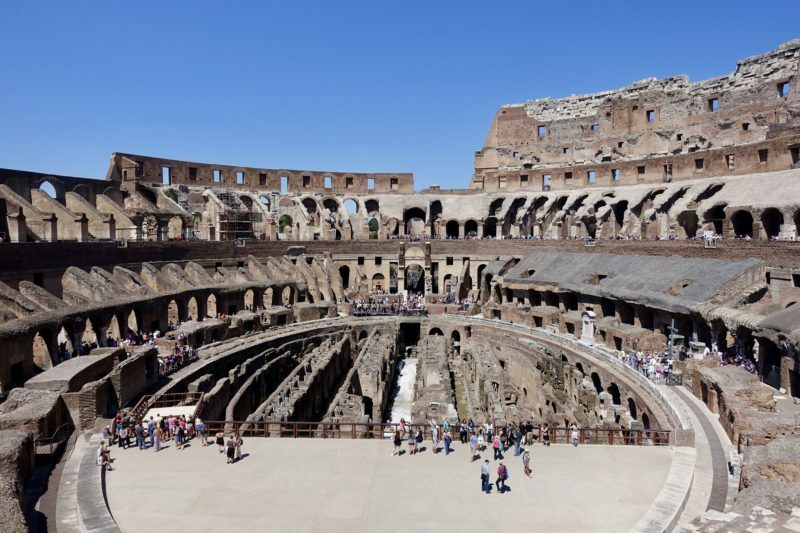 It is also possible to book some of the tours inside the Colosseum on the website too. If you do this, keep in mind that you have to choose a definite date and time, which locks you in. 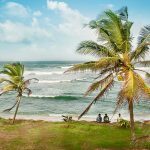 This might be exactly what you are after, but there is also the option to book once you arrive if you like more flexibility. They are booked right after entry into the Colosseum. These are the official tours by trained Colosseum staff. If you cannot buy your tickets on line, another tip I have seen is instead of joining the line at the Colosseum to buy them, walk across to the Roman Forum ticket box and buy them there. They are the same tickets, but the line up will likely be much shorter across the plaza. Note: Entry free on the first Sunday of each month, although no tour reservations are allowed in advance on the free Sunday. I was really unsure whether to try to get to the Colosseum really early to avoid the crowds, or leave it until later in the afternoon. Even with a skip-the-line pass, it is still possible that there can be a wait for entry during the busy times. 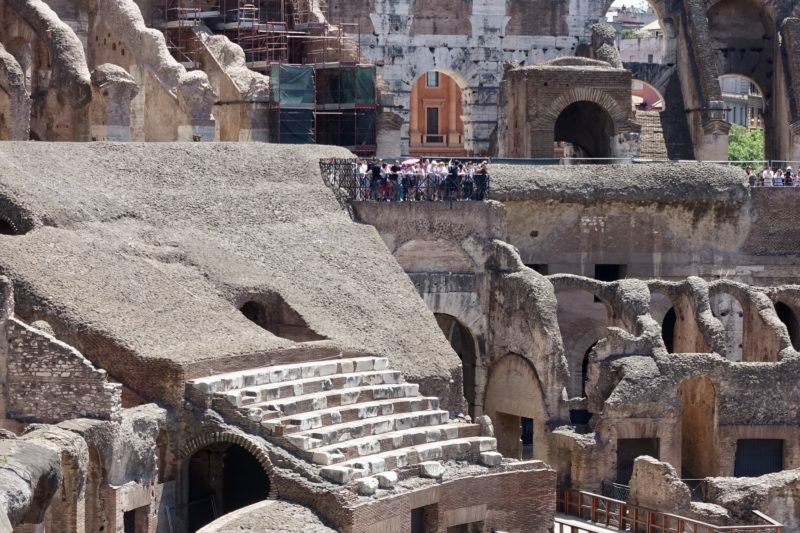 Only 3000 people at a time are allowed into the Colosseum so as to preserve the site. In the end I decided to leave it until later in the afternoon, and instead visit the Roman Forums and Palatines first. As we walked past the Colosseum entrance at around 11:30am we noticed no line at all! We immediately changed our plans and went straight inside. Within five minutes we were past security and the ticket barriers. A few metres on were the counters to book tours. Again, there was no lineup, and we were served immediately, booking tickets for the next basic tour for €5/person. Before the tour we had enough time for a quick look around the Colosseum. This allowed us to take photos and read the information in our own time. Inside the Colosseum. In the foreground is a recreated section of where the floor would have been. The tour started on time. (I will note there was a crazy long line to use the toilet, so give yourself plenty of time to meet your guide.) The Colosseum is well organised for tours, with signed meeting places for each tour group. While our tour says it could have up to 40 people, there were only about 15-20 people in our group. Our guide was organised and his English was great. He was an archeological researcher, so very knowledgeable. We didn’t go anywhere that we couldn’t go on our entry ticket, but the information given was well worth the 50 minutes and €5! The underground section of the Colosseum where performers, animals etc waited for their time in the arena. The underground tour offered for €9 contains mostly the same information but you also get to go down into the underground part of the Colosseum. This option was not available until later in the afternoon on the day of our visit. I presume it was booked out, but because I was only planning on doing the basic tour I didn’t ask any further. In hindsight, if it was available I believe this tour would have been worth it too. A section of marble seats that have been recreated to help imagine what the Colosseum used to be like. NOTE: Tour prices given are for booking inside the entrance in 2017. They may have changed slightly since then. The Roman Forum and the Palatine are right next to the Colosseum. The forum was the centre of political and social activity, including marketplaces, the business district and civic centre. The oldest ruins date back to 600BC. 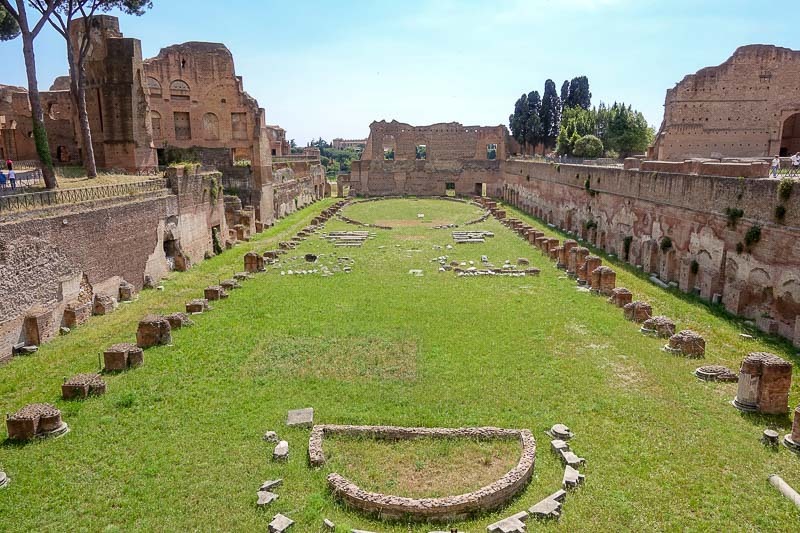 The Palatines are so called because they are located on Palatine Hill. 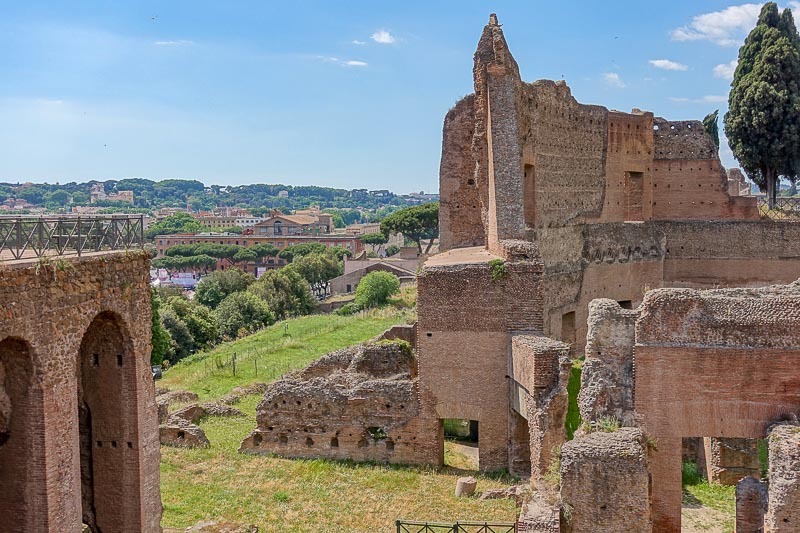 It is located between the Roman Forum and the Circus Maximus, and is where the wealthiest Romans lived. We spent around 60-90 minutes wandering around the area, but in all honestly, I think this would have been better done with a guide. I found there weren’t a lot of signs to explain what things were, and as such I think we missed a lot of detail that a guide could provide. 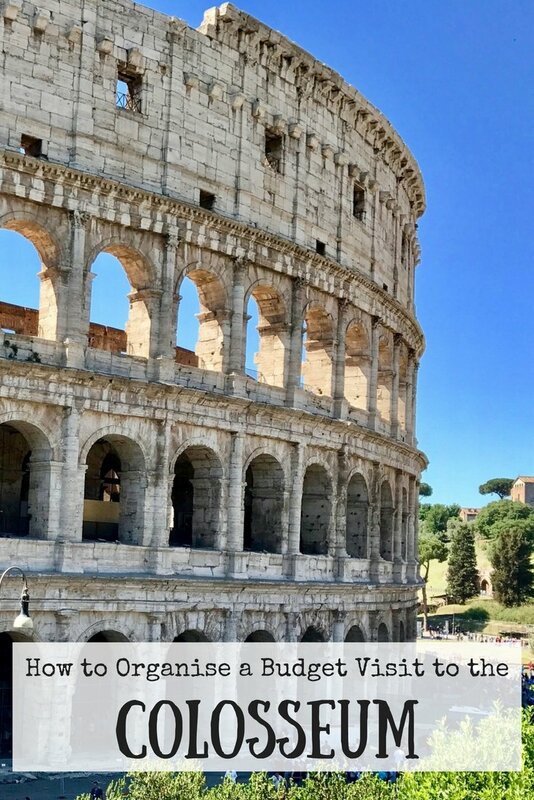 If, like us, your main goal is to see the Colosseum, and this is just an added extra, by all means just enjoy wandering through. Still Thinking About a Tour? 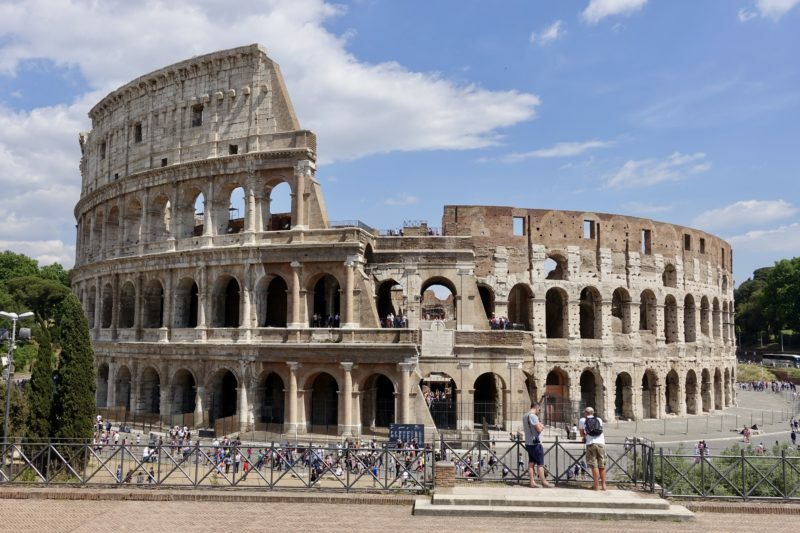 If you are still considering a tour that will include not only having a guide for the Colosseum but also for the Roman Forums too, then I recommend this tour. 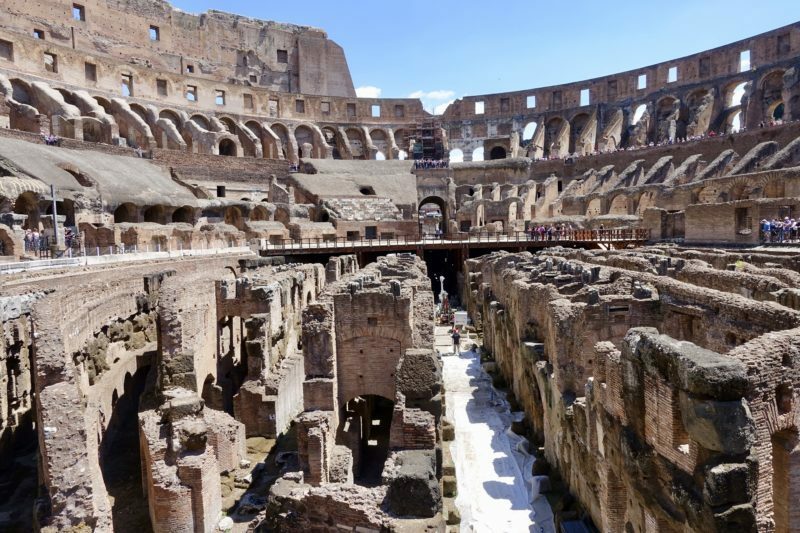 To add in the extra visit to the Colosseum Underground, click through to consider this tour. We found Rome to be a great city for walking. There was something to interest us around almost every corner. If you don’t want to walk, here are some other options. Train: There are two metro lines that stop at the Colosseo stop right outside the Colosseum. Bus: Many bus lines stop at the Colosseum. My suggestion for both of these is to use Google Maps to see the best options from where you are staying. Bus and train tickets cost €1.50 each, and are valid for 100minutes. Of course taxi or Uber are other options. We stayed at Hotel Colors. 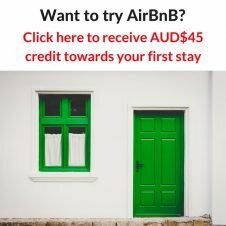 You learn heaps more about a place with a reputable guide. Our guide at the Colosseum was wonderful (Degree in Ancient History) but gave us so much info about the horrendous cruelty that even he was crying !!! I couldn’t wait to get out. Hahaha…that guide was just too good! I can just imagine the stories though – it would have been a horrendous place back when it was in full use! Thank you Bruce. I would love to hear how your visit goes. This is perfect! 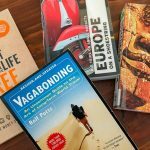 I’m going to Rome solo in September! I travel with my drone. Dis you see anyone with a backpack? I wonder if they will let me in…. although I’m sure I won’t be able to fly the drone inside lol. Thanks Leah! I couldn’t remember checking our backpacks, and I just looked at some photos and I can see people with them on, so I think you will be okay. Enjoy your visit. The weather should be perfect in September. Recently visited this dreamy site – shame I didn’t see this before going! Thanks Shannon. Rome is wonderful, but can sometimes be hard work with so many people wanting to see the unique sites. 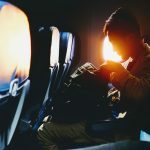 Do you email confirmation come right away? I just bought two tickets and received payment confirmation but I haven’t received my printable tickets yet. Hi Ashley. It’s been a few months since we went, so my memory is a little hazy, but I do not remember there being any issues. I am therefore assuming they came through reasonably quickly. Perhaps check your junk mail? I hope yours turn up soon. It’s been years since I’ve gone and I’m returning this year with my boyfriend who hasn’t been, so this is super useful! 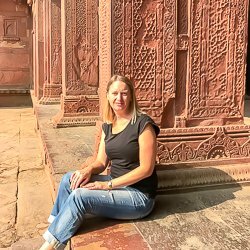 Thanks Rowena, I hope you enjoy your visit, and it’s as easy as mine was! I wish this post existed 5 years ago when I visited! My friends and I just rocked up on the day and had to wait in the queue. It wasn’t sooo bad as we were there from before it opened, but it got crazy long by midday! I had heard horror stories, and experienced some long queues in the weeks before so this was a godsend when I found these tickets.